Of special importance was the launching of a national culture of peace programme in the North. Otherwise, we risked identifying the culture of peace exclusively with the South, an approach which masks the true nature of the culture of war. This was pointed out by African ambassadors, Noureini Tidjani-Serpos of Benin and Bakary Tio-Toure of Cote d'Ivoire among others, when we held meetings with the Member States by region in March 1998. They stated that one should not look to the South for the causes of the culture of war, and they posed three questions. From where do the weapons come? From where do the violent television programmes come? And where are the terms of trade decided that impoverish the people of the South which leads to violence? The country in the North chosen for concentration was Russia, one which I knew well and for which I could speak the language. A series of discussions on this matter were held in 1995 and 1996 with members of the Russian Delegation to UNESCO. Having begun collaborating with Sema Tanguiane at the time, the Russian retiree who had been ADG of Education at UNESCO, I was able to meet and, in one case draw up a small contract, with his Russian academic friends. Other Russian contacts were made through Sasha Sannikov and Vladimir Lomeiko who were, respectively, a staff member and advisor to the Director-General. 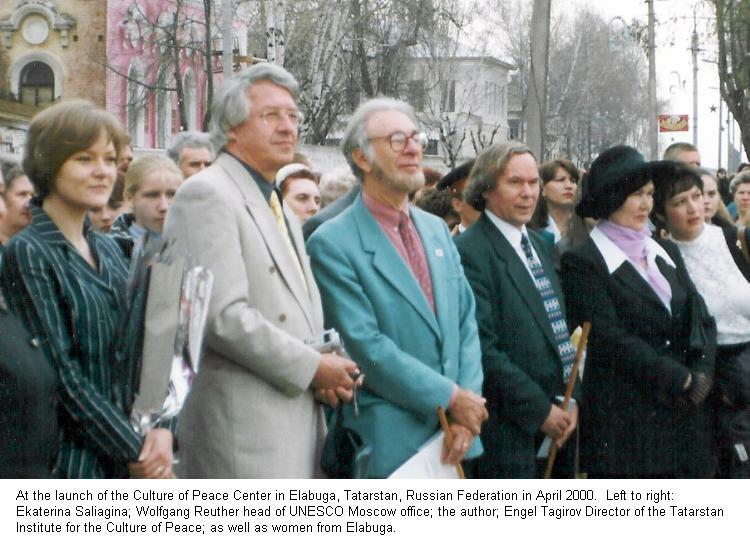 In February 1997, I accompanied the Director-General to Moscow and organized a roundtable of Russian academics to establish a Russian National Culture of Peace Programme. Later, 8-9 December 1997, this was formally launched at a national meeting prepared with the Ministry of Nationalities at which I represented UNESCO. A breakthrough for the Russia project came when the Director-General named Wolfgang Reuther as the UNESCO representative. Mr Reuther had been an early proponent of the culture of peace from his days with the German National Commission for UNESCO. In December 1997, meeting together in Moscow where I was attending the meeting organized by the Ministry of Nationalities and he had arrived for his briefing, we drew up a project which was presented to the Director-General in January 1998, along with a request for $200,000 for its financing. Over the succeeding several years, this project would be carried out with the cooperation of the Russian National Commission for UNESCO, as described in correspondence and report of 5 May 1998, reports of my missions 18-28 April 2000 and 2 March 2001 as well as colorful booklets produced for 1999 and 2001 by the Moscow office of UNESCO. The Russian project included many programmes in schools, at all levels from elementary schools to advanced university chairs, but perhaps the most important programme was the quest of a peaceful resolution of the conflict between Russia and Tatarstan. Like Chechnya, Tatarstan was a Muslim region that declared its independence from Russia after the break-up of the Soviet Union. But unlike Chechnya the conflict was resolved peacefully. 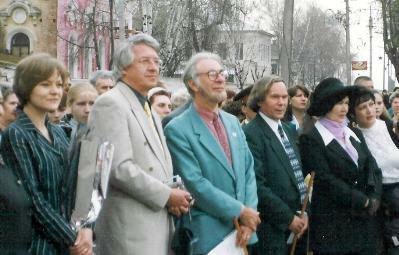 As pointed out in the mission report by Mr. Reuther and myself following our visit to Kazan in April 2000, "After declaring its independence from Russia in 1990, Tatarstan remained in dialogue with the Moscow authorities in the search for a peaceful resolution of their conflict until a treaty could be signed in 1994. During that time, the number of schools teaching in the Tatar language in Kazan was increased from 1 to 50, showing how important is the right to education in the national language (Tatars make up a majority of the population). The establishment of the Institute for a Culture of Peace in Tatarstan reflects their commitment to peaceful conflict resolution." The culture of peace had come of age. The 28th General Conference on 13 November 1995 adopted the six-year Medium-Term Strategy for UNESCO with the culture of peace as its major theme, stating that "the major challenge at the close of the twentieth century is to begin the transition from a culture of war to this culture of peace".